Police officers watch demonstrators as they continue to protest after the not guilty verdict in the murder trial of Jason Stockley, a former St. Louis police officer, charged with the 2011 shooting of Anthony Lamar Smith, who was black, in St. Louis, Missouri, U.S., September 17, 2017. ST. LOUIS - During a peaceful protest moments before St. Louis would erupt into three nights of racially charged riots, five people confronted a black police officer alone in his Jeep. “How do you sleep at night?” Lisa Vega, who is Hispanic, asked the officer through an open window. Next to Vega, two black men and two black women nodded. Such questions are typical of what African-American police officers face every time a white colleague kills a black man in the United States. Black cops are sometimes accused by their fellow African-Americans of betraying their race by joining the police, while at the same time they face pressure from their colleagues to stand by another officer. A number of police departments across the United States have been accused of excessive force and racially discriminatory conduct in recent years, fueling a public debate and the Black Lives Matter movement. The black cop in the Jeep calmly responded that he slept well and that he had bills to pay. He declined to be interviewed by the reporter who witnessed the encounter. 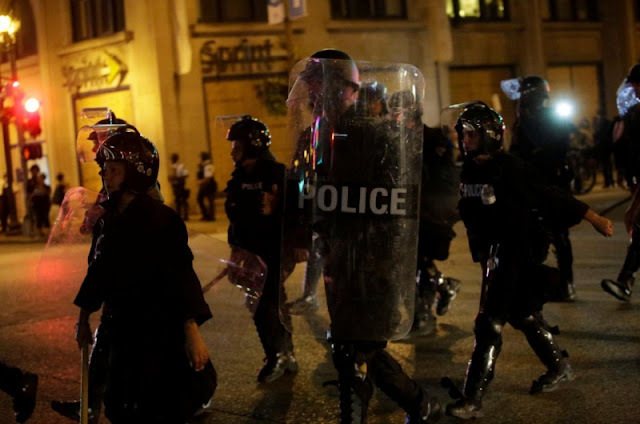 Peaceful daytime protests in St. Louis turned into three nights of vandalism and unrest that resulted in at least 123 arrests. With rain falling, Monday night’s demonstrations remained peaceful. The disturbances were provoked by the acquittal last Friday of white former officer Jason Stockley, 36, who was charged with first-degree murder in the 2011 shooting death of African-American Anthony Lamar Smith, 24, following a police chase. Prosecutors accused Stockley of planting a gun in Smith’s car, but Judge Timothy Wilson found the officer not guilty in a non-jury trial. St. Louis Detective Sergeant Heather Taylor took a stand against Stockley, publicly declaring in a video message posted on YouTube and a police association website three days before the verdict that he should be convicted. “Someone needed to say it,” said Taylor, 44, president of the Ethical Society of Police, an association formed by black officers in 1972 to combat racism within the St. Louis police department and improve community relations. She sees her role as calling out fellow officers for unjustified killings, which she hopes police of all races will eventually embrace. After she appeared in the video with Redditt Hudson, co-founder of the National Coalition of Law Enforcement Officers for Justice, verbal abuse poured in, largely on social media and from retired officers because, she said, no officer would dare confront her on the job. “I was called everything. You name it,” Taylor said, citing the most offensive of racial and misogynistic slurs. Taylor said she was unbowed by the attacks from the law enforcement family, but rejection from her fellow African-Americans cuts deep. The St. Louis Metropolitan Police Department did not respond to requests by Reuters for comment. Demonstrator Bill Monroe said Taylor’s video came too late to be effective and expressed little confidence that reformers like her can improve the system from within. Monroe, 71, is a black former St. Louis police detective with gray dreadlocks who is writing a screenplay about his experiences on the force in the 1960s and 1970s. He marched with a T-shirt reading “Anthony Lamar Smith” and a U.S. flag hanging upside down on its staff, a U.S. sign of distress. “My community is in distress, and that’s why I walk amongst those brothers and sisters trying to get justice,” Monroe said. While all police officers still encounter an internal code of silence that prevents them from speaking out more forcefully against abusers, this is especially true for black cops, Monroe said. “Nobody wants to be known as a troublemaker,” he said. Taylor, the president of the largely black police association, expressed confidence that police culture could change with steps such as hiring more officers of color. In a city that is 44 percent white and 49 percent black, according to U.S. Census data, only 29 percent of St. Louis police are black, Taylor said. In the meantime, she faces resistance within and outside the force. Taylor grew up in what she called the ghetto of St. Louis and said her fellow African-Americans were shortsighted in their criticism of black cops. During a peaceful protest moments before St. Louis would erupt into three nights of racially charged riots, five people confronted a black police officer alone in his Jeep. “How do you sleep at night?” Lisa Vega, who is Hispanic, asked the officer through an open window. Next to Vega, two black men and two black women nodded.